Design team members scout a potential site during the research phase of Resilient by Design. 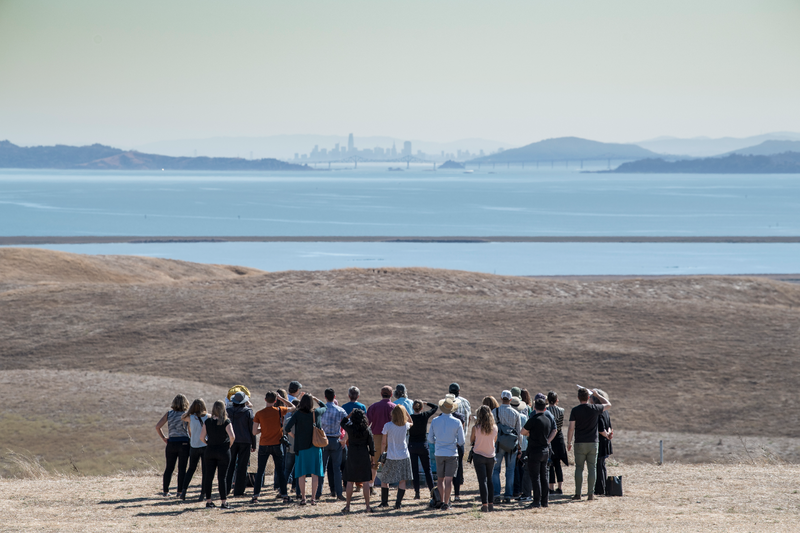 Resilient by Design’s year-long Bay Area Challenge culminated in mid-May with a two-day summit where nine innovative projects designed to address sea level rise and other climate impacts while enhancing social resilience in the Bay Area were publicly unveiled, discussed and celebrated. The design teams, which included local, national and international experts in planning, ecology and architecture/engineering along with community partners, unveiled their ideas during a juried day-long session in San Francisco on May 17, 2018. The next day, the activities shifted across the Bay to Alameda, where interested citizens and activists gathered together with the design teams and participated in group conversations about how to move resilience forward in the Bay Area. The two-day summit attracted some 700 people and was capped with a celebration and awards ceremony where the proposals were recognized for various features. Each team was assigned to one of nine locations around the rim of San Francisco Bay. Their ideas for containing and adapting to sea level rise on the Bay and flooding from worsening storms are as diverse as the sites. For San Rafael in Marin County, the assigned design team is recommending seeding the Bay with a network of artificial reefs, and constructing buildings in such a way that lower levels could flood without causing damage. The design team assigned to the South Bay envisions enhancing marshlands and salt ponds to create a sponge-life effect along 20 miles of shoreline. Several of the proposals aim to solve social problems and build community at the same time as addressing sea-level rise, by integrating clusters of high-density, flood-proof affordable housing, along with attractive outdoor gathering spaces. See the project website to view the various proposed solutions. At the summit’s closing celebration, each Design Team was awarded an Impact Recognition Award by the Resilient by Design Jury, a high-profile group of international designers, ecologists, and climate experts, to honor their extraordinary achievements over the last year. MTC was a sponsor for Resilient By Design effort, and housed the project staff at its offices at the Bay Area Metro Center in San Francisco. The Bay Area was selected for the Challenge based on its climate risk, its role as a global economic leader and the intersection of social issues with the threat of rising sea-levels. The challenge was modeled after the award-winning Rebuild by Design Hurricane Sandy Design Competition, which was pioneered by the U.S. Department of Housing and Urban Development in partnership with the Rockefeller Foundation. The Foundation also sponsored the Bay Area Challenge, with the idea of preparing the region for sea level rise and other hazards before catastrophe strikes, rather than reacting to a natural disaster. A parallel Youth Challenge involved some 800 students from 32 classrooms at 12 schools in five Bay Area cities. Their proposals for holding back rising seas, combatting inequality and reimagining their communities were showcased at a Youth Challenge Regional Summit held in late April 2018 at UC Berkeley.